It was a nice, sunny day. A perfect farmer's market day. Until the sky turned black and the downpours stared. Then it was mass panic and chaos as us vendors tried to quickly pack up our products before they were ruined and take down tables and tents, knowing full well that getting soaked was inevitable. My 45 minute drive home seemed to take forever, but I was glad it was cool enough outside that I could leave all the product in the car until the next morning. Luckily, it had stopped raining overnight, and the next morning was sunny and beautiful. I went out to the car to start unloading the maple products. I started to head back to the house when I caught movement out of the corner of my eye. 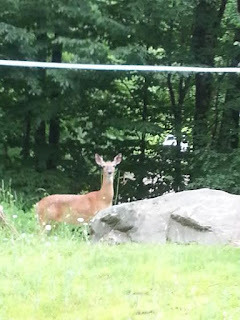 I turned slowly and saw a deer standing about 10 feet or so in front of my car. How cute, I thought as I gently put down the box of candy and slowly pulled out my phone to snap a picture. The deer, with its head up high looking straight at me, snorted. I backed up a few feet and picked up my box of maple candy. The deer continued to eat, so I started back to the house. Then the deer snorted again. I turned quickly and saw the deer coming towards me. I traded the box of candy for two half gallons, one in each hand (for self defense in case the deer decided to charge - a half gallon could hurt, right? ), and ran like a girl back to the house. I slammed the door shut and ran to the window, peering out between the curtains, watching the deer's every move. The deer circled my car a few times before heading down the driveway towards the road. I went back to the door and opened it ever so slightly, making sure the killer deer was nowhere in sight. I ran as fast as I could to my car, grabbed a box of maple candy, and sprinted back to the house. Then I ran to the window, on the lookout for that monstrous deer. Coast was clear so the process started over again: opening the door just a crack to scan the yard for the vicious wild animal, dashing to the car to grab the next box of maple products, and rushing back to the house before the ferocious deer returned. It should have taken about 30 minutes to unload my car, but that day it took me two hours. Two hours of panicking, worried for my life if that vile deer returned. I was glad my husband was working and not home to watch the spectacle. He would have teased me for being scared over a silly little deer. But, thanks to that deer, I am a lot more cautious before just running out to my car and am aware of the animals that could be around. 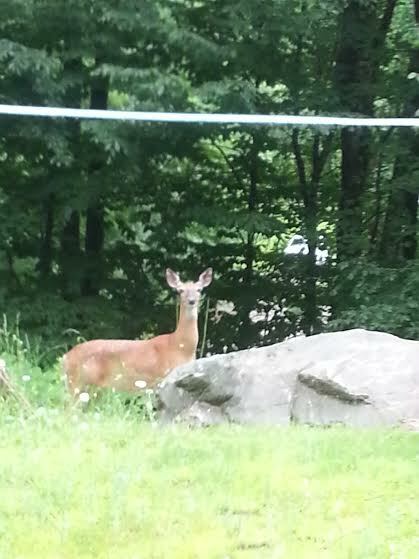 And now that we have a dog, our yard, at least, seems to have a lot less wild life in it. Too bad we didn't get her a few months earlier! Home / News / Oh, Deer!